Do you have questions about buying a home with your VA mortgage benefits? Our team of VA loan experts can guide you through each step. From getting prequalified to signing closing papers, our experts will help you meet your homebuying goals. Buy a HomeLet your VA loan benefit open doors for you.The right resources and advice can make buying a home easier. Choose a topic below to learn more. Used by over 20 million Veterans, these home loans offering zero-down-payment options were established in 1944 to help servicemembers returning from WWII re-enter civilian life. Made by approved lenders, VA mortgages have unique advantages over other kinds of loans. Over 23 million VA loans have been made to Veterans and their families since 1944. The program has a lower foreclosure rate overall, compared to other mortgage types. Rates are competitive, and can often be lower than conventional and Federal Housing Administration (FHA) loans. Little or no down payment may be required (up to the loan limit for your county). Private mortgage insurance (PMI) isn’t needed on these loans. Whether you’re buying your first home, needing more space for your growing family, or downsizing as an empty nester, the VA homebuying benefit can be used over and over. It’s possible to restore entitlement from a prior loan and use it again, making VA loans a benefit for life. Is a VA Loan the Best Option? There’s a reason why more than 740,000 Veterans and their families chose to use their VA loan benefits in 2017 alone. The benefits – zero down payment, no PMI, and, interest rates that are competitive with other major loan programs – can leave more money in your bank account and save you thousands of dollars over the life of your loan. Combined with the VA’s safeguards in the program that can help protect borrowers, the VA loan benefit is often the preferred option for eligible Veterans. If you are a Veteran, active duty servicemember, surviving spouse, reservist or national guardsman, academy cadet or midshipman, an officer of the National Oceanic and Atmospheric Administration (NOAA) or U.S. Public Health Service (USPHS), or if you are a WWII merchant seaman, you may be eligible. You were transferred to standby reserve or ready reserve. You are still serving in selected reserve. You have not remarried (or have remarried after age 57 on or after 12/16/2003 and have applied for eligibility by 12/15/2004). Your spouse died in service or from a service-related disability, OR is missing in action or a prisoner of war. Your spouse was totally disabled for a certain amount of time (10 years prior to death or not less than five years from date of discharge or release from active duty to date of death) and was eligible for compensation at death. Proof of your eligibility for your VA loan is given by a Certificate of Eligibility (COE). Your VA mortgage application will require a Certificate of Eligibility (COE). The document can be obtained in three different ways. Qualifying for a VA loan can be a fairly straightforward process. Since VA loans are made by VA-approved lenders, you must meet credit guidelines, have sufficient income, and obtain a valid COE from the VA. While the VA has minimum qualifying guidelines, individual lenders generally have additional requirements for their borrowers. VA entitlement: Do you have ample entitlement to back the loan? Eligible property: Does the property you’re financing meet the VA’s minimum property requirements (MPRs)? Occupancy: Will you live in the home as your primary residence? Financials: Do you have qualifying income, credit, and assets? Qualifying credit score: A credit score that meets your lender’s guidelines. At Veterans First, the minimum credit score is 600. Workable DTI ratio: A debt-to-income (DTI) ratio low enough to pass underwriting standards. Adequate residual income: Residual income within the standard for your region and family size. Steady, long-term income: Proof of a consistent income source, generally two years’ worth. 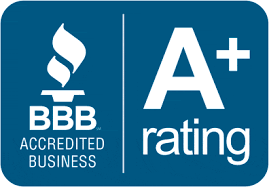 Reliable credit history: Resolution of any major credit issues or a track record of responsible use. What If I Don’t Qualify Right Away? If you don’t qualify immediately, don’t be discouraged. Often, it’s a matter of improving your credit and demonstrating that you’re in a position to make mortgage payments on time. Many hopeful borrowers find that they need to work on their credit first before qualifying for a VA home loan. And generally, borrowers whose credit does not qualify at first can take a few simple steps to improve their credit. Those who overcome credit hurdles often find it to be a rewarding and educational process. The VA home loan program has loan limits in place. Simply put, a VA loan limit is the maximum amount the VA will guarantee for the lender on a zero-down-payment loan in a particular area. While VA loan limits vary by county, region, or territory, in most states the 2019 limit is $484,350. But the limit is higher in more expensive areas (for example, San Francisco or New York City) or in statutorily designated high-cost areas, including Alaska and Hawaii. In such areas, the loan limit is set at $726,525. You can borrow as much as you can afford with a VA loan, even if it’s over the loan limit. Loans over the limit require a down payment, but only on the portion that exceeds that region’s loan limit. There are five main steps in the VA home loan process: research, prequalification, house hunting, processing and approval, and closing and moving in. Learn more about these steps below. Research homes in your desired neighborhoods to get an idea of what kind of home you might like to own. Also, begin reaching out to lenders. This can give you a good feel for what kind of services and loan products are available to you. Sellers (and their real estate agents) typically prefer a “prequal letter” to accompany serious offers. A VA-approved mortgage lender, not the VA, provides the letter. To prequalify, tell your lender all about your credit, income and assets. Keep in mind that you’ll be documenting everything later. If you prequalify, you will get a letter stating that you’ve prequalified to purchase a home, within a ballpark price, pending final loan approval. Shopping for your dream home is exciting, but may require some patience. Make a list of features you want and need in your home. Many of our clients have found it helpful to work with a real estate agent who is familiar with VA loans. Once you find your home and make an offer, you’ll want to get the purchase agreement to your lender right away. As your loan is processed, an appraisal will be done on the property. You will be asked to provide various financial documents to your lender, including tax returns, pay stubs, and bank statements. Other information, such as a divorce decree for example, may also need to be submitted. Documents like these are needed to complete your file so you can be eligible for final approval. Once your loan is ready, you’ll attend your closing and sign your loan documents. Nothing beats receiving your new keys and opening the door to a home that’s now yours! VA home loans have competitive rates when compared to other programs, and the VA’s program puts restrictions on lenders when it comes to the fees that can be charged. 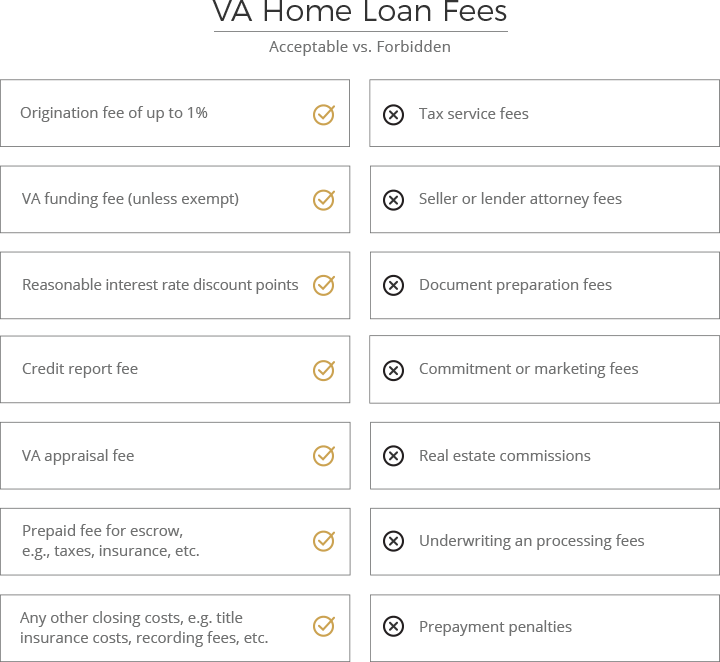 How Do VA Home Loan Rates and Fees Compare to Conventional Loans? VA loan rates tend to be competitive when compared to rates for conventional mortgages. In fact, it’s not uncommon for Veteran borrowers to get better interest rates on VA home loans than they are offered for conventional mortgages. VA loans are also attractive to borrowers because the VA home loan program forbids lenders from charging certain fees. VA borrowers don’t have to pay private mortgage insurance (PMI) each month. PMI is a monthly payment typically required on conventional loans when a borrower puts less than 20% down. While it provides security to the lender, it offers no direct benefit to the borrower. Not having to pay PMI can save you $50 to $100 monthly for every $100,000 of the loan amount, making it one of the favorite features of VA loans. The VA Funding Fee is a one-time fee paid to the VA to cover administrative costs of the VA home loan program. Borrowers can pay it up front, or roll it into their loan. Surviving spouses and certain disabled Veterans are exempt from the fee. VA loan limits refer to no-down-payment loan maximums, which change based on location. VA loan limits do not “limit” the amount you can borrow with your benefit. VA loans over the limit require a down payment. The loan limit, also known as the “baseline loan limit,” is $484,350 in most areas. This means that if your loan is within the loan limit and you have enough entitlement, you can potentially qualify for a no-down-payment VA loan. If you live in an area where homes are more expensive, there’s a chance your loan limits are higher than the $484,350 baseline. In fact, the high-cost ceiling can be as high as $726,525, and even higher in Hawaii, Alaska, Guam, and the U.S. Virgin Islands, where special legislation exists for higher limits. A location is designated a high-cost area if its median home value is 115% over the baseline loan limit of $484,350. The loan limits in these areas are set at the median home value, or the ceiling, whichever is lower. What’s My Down Payment If My Loan Exceeds the Limit? Let’s look at San Francisco, which has consistently been one of the most expensive housing markets in the U.S. There, the median home price can be as high as $1.6 million, but the VA’s loan limit is $726,525. Remember, the VA is willing to back 25% of your loan up to the limit. If your loan exceeds the limit, you’ll need to make a down payment – usually 25% of the portion of the loan that’s not guaranteed by the VA. But even in this case, your down payment will be far less than if you were to put the conventional 20% down on the whole amount. In addition to VA loans, the U.S. government also administers FHA and USDA home loan programs that have their own unique benefits. For some households, Federal Housing Administration loans – commonly referred to as FHA loans – may be the best path to homeownership. FHA loans are insured by the federal government, and are available to U.S. citizens who qualify. Your unique circumstances will determine which loan program is right for you. If you’ve earned VA home loan benefits, and you have enough entitlement, the VA home loan is often the preferred route. However, there are situations where an FHA loan makes sense. For instance, if two unmarried people want to purchase a home together using both of their incomes to qualify for the loan, but only one is eligible for VA benefits, the VA program generally isn’t an option. In such a case, the FHA program can be a great fit. A USDA home loan, also called a USDA Single Family Home Loan Guarantee, is a mortgage program offered by the U.S. Department of Agriculture (USDA) to low- and moderate-income homebuyers interested in purchasing, rehabilitating, or relocating a home in an eligible rural or low-density community. Generally, the USDA defines “eligible rural areas” as communities with a population of less than 35,000. The USDA sets aside these loans for low-income homebuyers, and sets income limits at 115% or less than the region’s median income. Little to $0 down payment required. Low fees, including low mortgage insurance requirements. Flexibility for lenders to accept a wide range of credit scores. Available to U.S. citizens, noncitizens, and qualified aliens. Loan amount can be up to 100% of appraised value plus guarantee fee. Income requirements take into consideration household size and location. VA, FHA, and USDA loans all have their unique features, and may present options for Veteran homebuyers. These programs all offer zero or low down payments, and streamlined refinancing. And all three loan programs require owner occupancy. U.S. Veterans, active duty servicemembers, and surviving spouses may be eligible for VA loans. VA loans may not require down payments, as long as the loan is within the county’s loan limit. Private mortgage insurance (PMI) isn’t required for VA loans. VA loans require a VA Funding Fee, which can be paid up front or rolled into the loan. FHA loans are available to U.S. citizens 18 and older. Borrowers are eligible for approximately 96.5% financing. Monthly mortgage insurance is required by HUD, the government body that insures FHA loans. FHA loans require an upfront mortgage insurance premium, which can be rolled into the loan. U.S. citizens, eligible noncitizens, and qualified aliens may be eligible for USDA loans. Down payments may not be required. USDA loans don’t require military service. Borrowers who qualify as very low income are eligible for USDA loans. How Do I Know Which Program to Use? The decision to use an VA, FHA, or USDA loan depends on your set of circumstances, including if you have VA eligibility with enough entitlement to back a VA loan, or would like to live in a rural area. Depending on your situation, you may want to consider an FHA or USDA loan as an alternative. 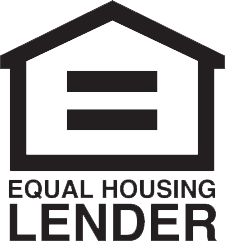 Both programs offer unique features that have helped many borrowers achieve the dream of homeownership. Your loan officer will help you understand the tradeoffs of the various programs available to you, and will help you choose the one that best fits your needs. In a Veteran’s journey to homeownership, specialized expertise and personal attention can make all the difference. Watch our clients describe how their Veterans First loan team stepped them through the process to accomplish their goals.